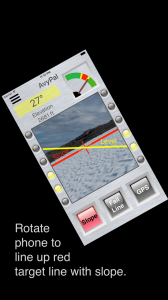 AvyPal is an avalanche awareness safety app for the iPhone. Fall Line Mode - Shows the angle and avalanche risk of a slope you intend to descend, or ascend. Slope Mode - Shows the angle and avalanche risk of a slope you intend to cross. GPS Mode - Uses GPS data to audibly alert you if you are descending or ascending a slope angle that is associated with avalanche risk. Audible alerts are given every 5 seconds if in avalanche terrain. 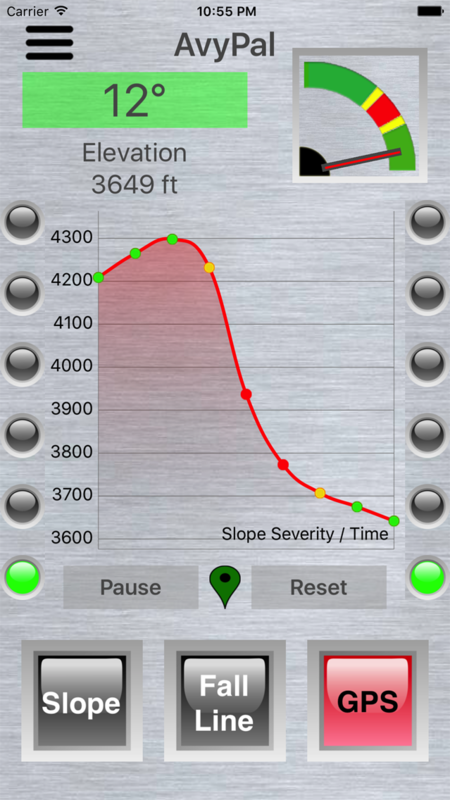 A graph is also shown in the mode so you can review if you have recently traveled in dangerous terrain. AvyPal uses color-coded indicators to indicate the avalanche risk of backcountry terrain. Red indicates a high probability avalanche slope (30-45 degrees). Yellow indicates a lower probability avalanche slope (25-30 degrees or 45-50 degrees). Green indicates slopes of less likely avalanche potential (less than 25 degrees or greater than 50 degrees). 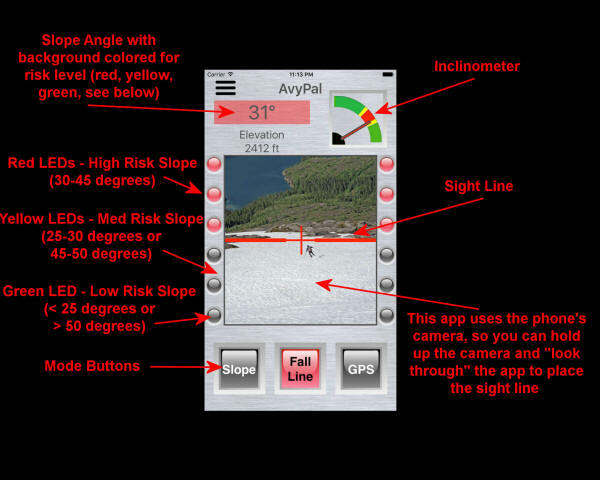 AvyPal is a backcountry tool for help in making route choice decisions. 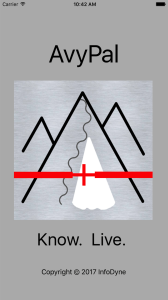 AvyPal does not replace professional avalanche safety training, experience or good judgment. Get avalanche awareness and safety training before traveling in the backcountry. Have fun in the backcountry. And if you have a question about the safety of the snow slope ahead ... don't hesitate to ask your AvyPal for advice! Red - Dangerous avalanche slope (between 30 and 50 degrees). Yellow - Moderately dangerous avalanche slope (between 25 and 30 degrees or between 45 and 50 degrees). Green - Low probability of a large avalanche (slope less than 25 degrees or greater than 50 degrees). Note: These avalanche slope metrics are based on US Forest Service avalanche safety charts. Single ping (when in GPS Mode) - in yellow avalanche warning zone. Double ping (when in GPS Mode) - in red avalanche danger zone. High pitched blip - GPS signal found. Lower pitched blip - GPS signal lost. This AvyPal function can be used for crossing slopes perpendicularly. Hold the phone up so that the red and yellow lines are aligned. 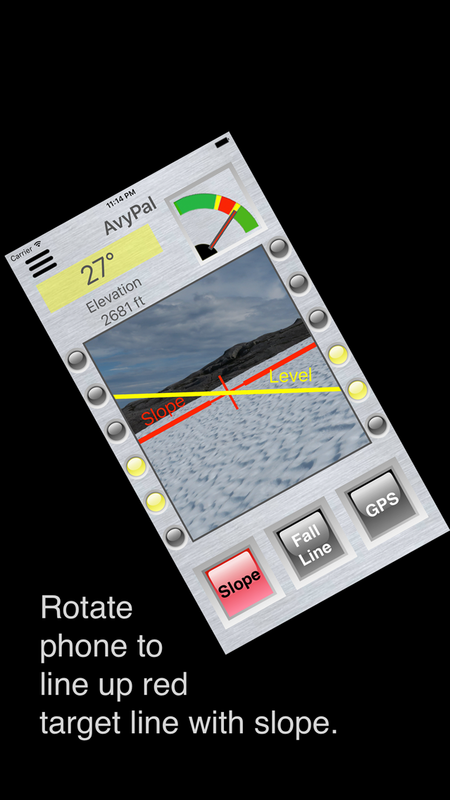 Then rotate the phone to the left or right until the red 'Slope' line is aligned with the terrain. You can also use the top of the phone as a 'straight edge' and align it with the terrain slope. Once the phone is tilted to the desired position, the angle text will be shown, the inclinometer needle will show the angle and the LEDs will indicate the slope severity. This function can also be used to judge the angle of distant slopes. 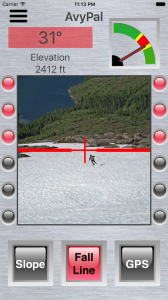 Use this mode to gage the slope you are climbing or descending on the fall line. Point the phone uphill or downhill and sight the red crosshairs to an object that is the same height off the snow as your phone. 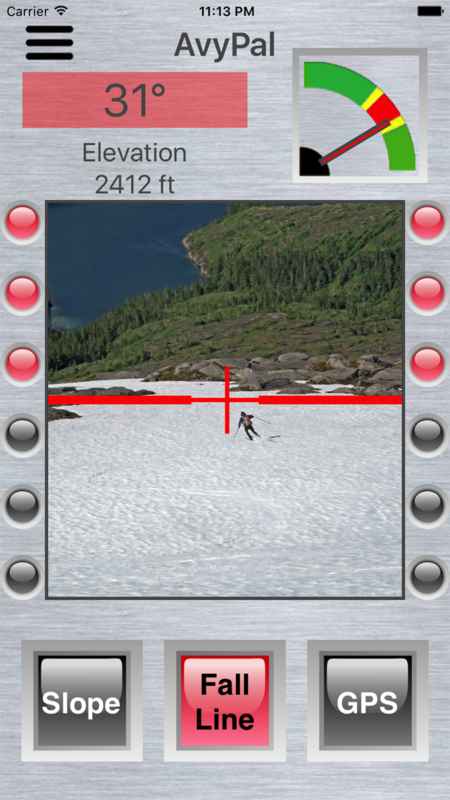 GPS mode can be used to monitor the slope you are on while you are skiing. GPS mode is only effective when used while traveling on the fall line. Every 5 seconds the angle of the slope you have been on will be calculated from GPS altitude and distance changes. If AvyPal detects that you are on a dangerous slope, it will beep once if you are in the yellow zone, twice if you are in the red zone (see above for descriptions of color convention). In addition, the GPS slope information will be saved and charted. 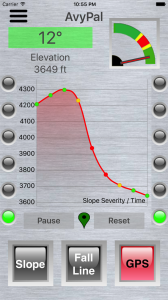 The GPS chart shows the angle severity of the slope you were on every 5 seconds for up to the last 30 minutes. On the chart, the color of the markers reflect the normal, warning and danger color coding conventions (explained above). A black marker indicates no GPS service is available. The Reset button clears all recorded GPS history. The Pause button pauses the charting of data, so that you can use finger gestures to scroll back over historical GPS slope angle data. Take the chart off Pause and normal charting will resume. Green - Good GPS signal. White - Poor GPS signal. Choose meters or feet as units of elevation. Turn on or off the GPS warning beeps. If GPS warning beeps are enabled (see above), then setting this feature allows GPS-determined slope angle beeps to occur in all modes. This is a good option to set so that when your phone is stored in a pocket or pack, the GPS beeps don't stop because a mode button was bumped and the mode changed out of GPS mode. When the GPS mode button is selected, a long press can be made on the Reset button (press until the button text says 'Simulate'). This will put GPS charing into simulation mode. Simulated slope changes will be charted so you can see how the chart works and hear the warning beeps. GPS latitude and longitude are usually more accurate than elevation. So, there may be spurious data when the GPS locks to different satellites. A technique called Kalman filtering is used to smooth out erratic GPS readings. If AvyPal is running in the background and the screen saver comes on, GPS sounds and tracking will stop. To keep the app active, it should be run in the foreground. The sound of your phone may be muffled by clothing. Consider using earphones or an external Bluetooth speaker in order to hear GPS Mode warning sounds.